Need a heavy dose of Art meets Activism? Manifest: Justice gives you just that. The weeklong exhibit that runs through May 10 at the Baldwin Theater in Los Angeles features the works of some 200 artists focusing on the social issues impacting communities of color in America today. Prominent among the themes are mass incarceration and police brutality, the pieces on display giving artistic representation to the unrest in cities like Baltimore and Ferguson. Launched by the publicist Yosi Sargent in 2014, the event came as a response to the growing civil unrest in Ferguson following the acquittal of police officers involved in the shooting death of unarmed black teen Michael Brown. Sargent called on the artist community, which responded in force. The free exhibit runs through Sunday. Below is a brief look at just a few of the artists on display. Joseph Tipay is of Mexican-Filipino descent. A native of Fresno, he grew up watching his godfather, a muralist, paint images of Cadillacs and low-riders. Tipay says that’s when he got hooked on art, looking to his grandfather and “the streets” for guidance and inspiration. “It kept me out of trouble,” Tipay said. Tipay’s Freedom Letters is a black and white image of a man in prison receiving letters in envelopes from the sky. Accompanying the piece is Prison Letters, which colorfully shows a younger man and his children sending the sealed envelopes into the sky. 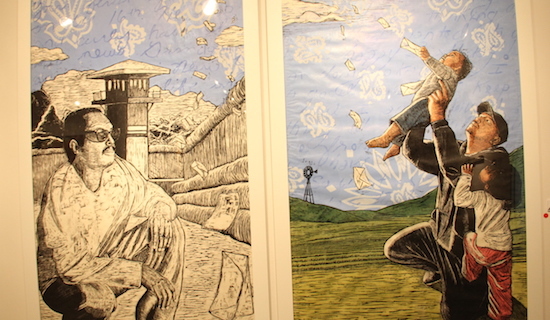 “The piece is about my father … He’s been incarcerated most of my life,” Tipay said, adding he was initially reluctant to depict the personal stories of his father’s incarceration. What began as a means of venting his frustration soon became something more. Tipay’s work can be seen at www.josephtipay.com. 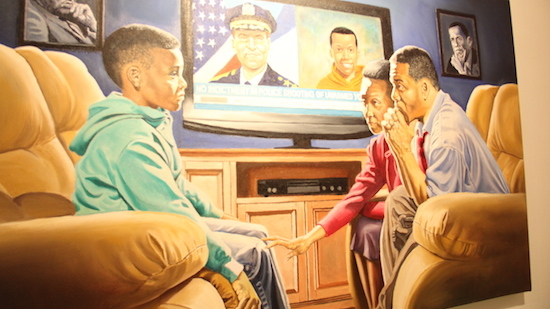 Michael D’ Antuono’s painting The Talk has received national attention. In it, two African American parents sit pensively across from their child. In the background a television broadcasts the acquittal of a white police officer in the shooting of an unarmed black youth. D’ Antuono said many black families have approached him about his piece with gratitude. “Everyone has said they’ve had the talk,” D’ Antuono said, adding he hopes the message conveyed reaches all communities. At 59, D’ Antuono spent his career in advertising until ten years ago, when he picked up painting again and later took on socially-relevant art. “I believe regular art that is nonpolitical is for decoration. I like to do a little more with my art and that’s to make change,” D’ Antuono said. D’ Antuono’s other pieces, such as The Truth which depicts President Obama in a Jesus-like pose with a crown of thorns, and A Tale of Two Hoodies, a Trayvon Martin-inspired image, have also attained national acclaim (and controversy). D’ Antuono’s pieces can be seen at www.artandresponse.com. Kyle Goen’s These Are my Brothers: Ayotzinapa 43, tackles the disappearance of 43 students last year in the Mexican state of Guerrero. Their disappearance is widely attributed to the drug cartels in the area and their ties to local police and office holders. 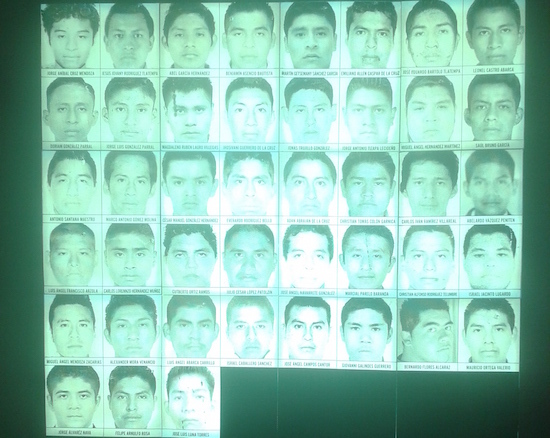 The piece features each of the students’ faces, dimly colored, printed on reflective vinyl. As you take a flash photo, like the piece’s instructions tell you to, the students’ faces become lit clearly on your camera’s image. The piece “demonstrates the idea of shining a light on the unknown, on darkness,” Goen said. Goen named the piece after identifying himself with the 43 students — and their radical “normalista” schooling. The term refers to left-leaning educational centers in Mexico that provide teachers with undergraduate degrees. “These are my comrades,” said Goen. Goen has shown his piece at Times Square in New York. “A lot of the work I do has a life outside of galleries, usually participating in movements,” Goen said. Some of the parents of the 43 missing students, for example, have worn his protest art on shirts. Goen, a New York-based artist originally from California, began mixing art and politics when the 1992 Los Angeles riots occurred. In the run up to the U.S. invasion of Iraq, he cut apart a U.S. flag and stitched it back together in the style of an Iraqi flag. “As an artist, I’m trying to move history forward,” Goen said. Goen’s work can be seen at www.kylegoen.net.